With whom do I argue the most? It would have to be people on the left that argue as socialists or statists and don’t put much emphasis on property rights. Well this country ranked with Canada, New Zealand and even Chile, a developing country on its way to first-world status is losing ground says the Cato Institute in a new report on Economic freedom. You cannot have a booming economy, low unemployment, rising wages and a safety net for the poor if there is little or no economic freedom. We have lost our way. This country needs to throw off the shackles and throw out politicians who vote for less economic freedom. We need to educate our children starting now! Susette Kelo, the woman known for her courageous stand against eminent domain abuse in the Supreme Court case, Kelo v. City of New London, will have her name added to the American National Tree, a popular exhibit inside The Story of We the People at the National Constitution Center in Philadelphia, Penn. The ceremony will take place on Friday, September 17, 2010, at 10:00 a.m. The exhibit tells the stories of more than 100 Americans whose actions have helped write the story of the Constitution. The Supreme Courtâ€™s 5-4 decision against Kelo sparked a nation-wide backlash against eminent domain abuse, leading eight state supreme courts and 43 state legislatures to strengthen protections for property rights. Moreover, in the five years since the Kelo decision, citizen activists have defeated 44 projects that sought to abuse eminent domain for private development. While upholding the taking, the New York court did not go so far as to embrace the United States Supreme Courtâ€™s much-maligned reasoning in the 2005 Kelo v. City of New London case, which held that the U.S. Constitution allows governments to condemn property for economic development alone.Â Instead, the Court found the takings were for a â€œpublic useâ€ because of the ESDCâ€™s determination that the area to be condemned was â€œblightedâ€â€”a determination that was based on a study paid for by the would-be developer and not even initiated until years after the Atlantic Yards project was announced. You can justify anything if it’s for “the public good!”Â Your life and property are not safe under that justification! First, I am fighting Eminent Domain. When the state says, as in NC, “The bill, a response to the U.S. Supreme Courtâ€™s Kelo case, prohibits the condemnation of private property unless it will be used for an exclusive public use such as government purposes, public utilities or to eliminate blighted areas. Did you note the weasel words: unless, public use and blighted? Second, I am fighting abortion in the third trimester. They want us to believe that no babies fetuses are delivered with all but the head showing and killed in the third trimester. Then they want us to believe that no doctor would order such a procedure except for â€œpreserving the life or health of a motherâ€. Note the weasel words. Weasel words that take away our sovereignty. Read what Phyllis Schlafly thinks about the treaty. Fourth, I am fighting against UN sponsored Convention on the Rights of the Child (CORC). CORC is a direct slap at families that prefer homeschooling to the statist schools. The governments wants all children to be indoctrinated in statist thinking and cannot control what is being taught in the home. So now we have CORC that apparently been approved byall countries except Somalia and the US. Until two years ago, we never encountered any problems with the authorities concerning our familyâ€™s home education. In fact, compared to neighbouring countries, Belgium was very tolerant of homeschoolers. In 2003, however, the Flemish regional parliament decreed that all homeschoolers are obliged to sign a document in which they promise to rear their children along the lines of the UN Convention. The latter undermines the authority of parents and transfers it to the state. The document the homeschoolers are made to sign also states that government inspectors decide whether families comply with the UNâ€™s ideology. Furthermore, it contains a clause in which the homeschooling parents agree to send their child to an official government recognized school if the inspectors report negatively about them twice. Note all the weasel words. What worries many about CORC is that government officials can decide if your child is suffering neglect or is abused because you are not instructing them in the proper core statist philosophies. The upshot is: your child can be taken away from you and placed in a foster home where the child can get the proper education. It’s for the children and the public’s safety. The fear by some is that Barack Obama favors the UN and will have a democratic controlled congress that will ratify these two measures. I’m afraid these highsounding documents are filled with weasel words that can be interpreted any way the state wants. One more reason to have judges appointed by someone who believes a strict interpretation of the Constitution. 3 Years Ago SCOTUS took Kelo’s House! June 23 is the third anniversary of the infamous Kelo eminent domain case, the U.S. Supreme Court decision that allowed perfectly well-maintained private homes like mine to be taken by the government and handed over for someone elseâ€™s private use. Under that ruling, any home could be taken and destroyed to make way for high-end condos. Any small business could be bulldozed to make way for a big box store. And, tragically, that is what is happening in too many parts of our country. Iâ€™d like your help to put an end to that abuse of eminent domain once and for all. Please go to www.ij.org/keloday today and pledge to give some small contribution to the Institute for Justice (IJ) on June 23. IJ helped defend my home and my neighborsâ€™ homes when they were threatened by eminent domain for private gain. IJ continues to defend other homeowners and small property owners in similar fights. One hundred percent of the money raised on this site (www.ij.org/keloday) on the 23rd will be used to fight eminent domain abuse–the use of eminent domain for private development projects. We recognize that under the Constitution eminent domain can be used for genuine â€œpublic useâ€ projects, such as for a courthouse or to build a highway, but when government power is used to take land from one private property owner only to hand that land over to another private person for their private profit, that is an abuse of governmentâ€™s power. Our goal is to earn 10,000 donations for IJ on that one day, Monday, June 23. Leading up to the Kelo argument, the Institute for Justice documented that 10,000 American property owners had their property threatened or actually taken by eminent domain for private use in just a 5-year period. That 10,000 figure inspired IJ and me to seek 10,000 donations from across the country to send a message to those in power that we care about our homes and that the abuse of eminent domain must be stopped. We are not seeking large contributions on the 23rd: just $25, $50 or $100. Even a $5 contribution will make a difference and add greatly to the ambitious numbers weâ€™re trying to achieve on that day. And, if you feel strongly enough about this effort and would be willing to forward this to friends who will join us in the fight to end eminent domain abuse, that too would be greatly appreciated. 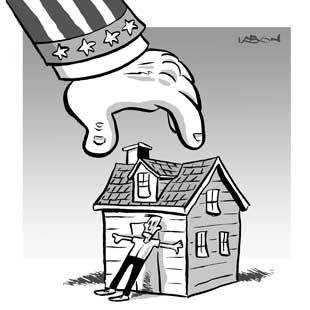 Together, we can convince policymakers that eminent domain abuse is un-American and must be stopped. I contributed $25! Won’t you match me or give what you can. It may be your house next time. Private property shall not be taken except for a public use, including preservation for that use. Public use does not include the taking of property for the purpose of thereafter conveying an interest in the property to a third party for economic development. This paragraph does not apply to the taking of blighted properties as defined by general law, nor to takings for access by the owner to property. As used in this paragraph, blight includes only the physical condition of the property taken. To be sure, there are a lot of weasel words that can have a variety of definitions, but its intent is to preserve property rights in the state. It was sent to the Senate where it was referred to the Ways and Means Committee, a convenient place where bills are sent to die. Now with the General Assembly near its end, the bill’s proponents want it brought to the senate floor. That last sentence is exactly why many of us are against the Supreme Court decision on Kelo, and why we want specific protections written into the state constitutions. You can’t trust some politicians to put your property rights above private interests who dole out campaign dollars. North Carolina Democrats, supposedly the party of the people, should be ashamed for bottling up this bill! Eminent domain: HB 508 lays down specific conditions before the state may condemn private property under the state’s eminent domain laws. The bill, a response to the U.S. Supreme Court’s Kelo case, prohibits the condemnation of private property unless it will be used for an exclusive public use such as government purposes, public utilities or to eliminate blighted areas. Who has the power to define “blighted”? The right to private property being a fundamental right, the term â€œpublic usesâ€ mentioned in Article I, Section 11 of the Constitution of Virginia is hereby defined in all instances to embrace only the ownership, possession, occupation, and enjoyment of land by the public or by public agencies, the use of land for the creation or functioning of any public service corporation or public service company, including but not limited to railroad companies, which has been granted or delegated the power of eminent domain, or the use of land for any entity that owns, operates, or maintains a road that is open to and services the public generally. In determining whether a use constitutes a public use, public benefits or potential public benefits including economic development or private development, an increase in the tax base, tax revenues, employment or general economic health and welfare shall not be considered. Any taking of private property must be necessary to achieve the public use, and the public interest must dominate the private gain. Except as stated herein, the taking of private property for the primary purpose of transferring or leasing to private parties shall not constitute a public use. Any taking under the pretext of an alleged public use shall be impermissible when the primary purpose is to bestow a private benefit. How many times do they need to say it? Many times before the Supreme Court gets on the same page. Any taking under the pretext of an alleged public use shall be impermissible when the primary purpose is to bestow a private benefit.